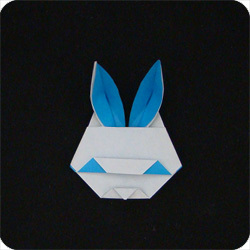 This origami rabbit face is a clever design which uses both sides of the paper to get the best effect. You can use origami paper which has color on one side and is white on the back side. 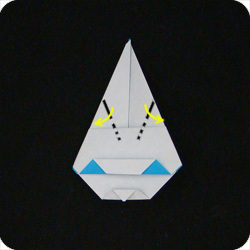 Or, you can use double sided origami paper which has a different color on the back and front. No double sided paper? Not a problem, you can still make the model and the multiple layers of paper will be enough to give an impression of eyes and nose. The big ears help identify that it is a rabbit. This model is not hard to make, but if you use thick paper, then you may have to put the model under a heavy book for a day to keep the creases down. 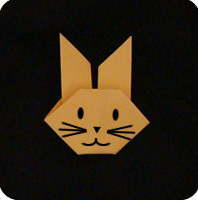 Start with a sheet of origami paper. Place the colored-side facing up. Position the paper in “diamond” position (balanced on one of its corners). Fold the paper in half (bottom to top). 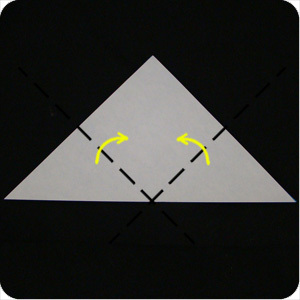 Fold the bottom-corners to the top of the triangle. 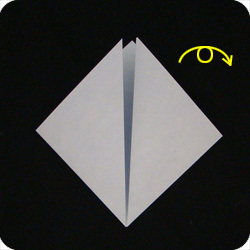 Fold one layer of paper down as shown. Fold this layer of paper back up towards the middle of the model (red dot). Fold down the second layer of paper. 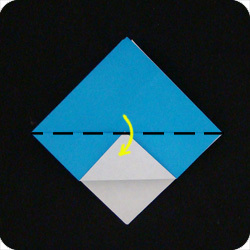 As in step 4, fold this layer of paper up to the middle of the model. Fold the layer of paper down about 1/3 of the way. 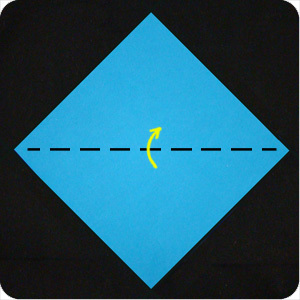 Fold the paper down one more time for the remaining 1/3 of the way. This gives the impression of eyes. 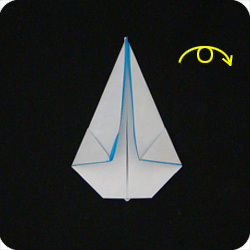 Fold the bottom corner of the model up to where the eyes are located. Fold this section back down about half way. This gives the impression of a nose. 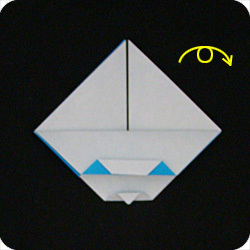 Fold in the left and right edges of the paper so the ears are more narrow. 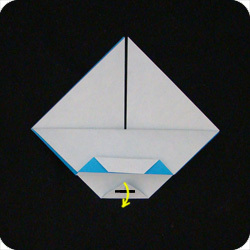 Finger through the layers of paper at the ears and find the place where the paper changes color (two layers of paper). Peel these two layers back to expose the colored paper. 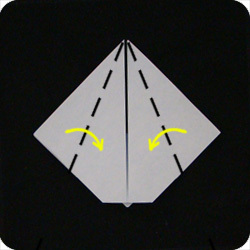 Press down to establish the fold. 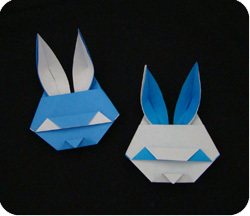 The ears look better if you make the fold so it extends beyond the level of the bunny’s head.